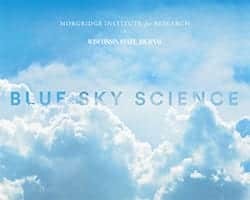 News & Stories > Blue Sky Science > How much does a human brain typically weigh? The average human brain weighs about three pounds, representing about two percent of our body weight. The human heart pumps blood to the entire body, but actually pumps about 20 percent of its total blood output to the brain. So the brain receives 20 percent of the blood pumped through our heart, a fact that is a testament to how important and remarkable this organ really is. The human brain includes 100 billion neurons, or brain cells, and is an ever-changing organ. A number of factors can cause brain cells to die or regenerate. For example, if someone has significant untreated depression, they can lose brain cells. The remarkable news is that when depression is successfully treated, those cells grow back and the brain returns to the size it’s supposed to be. The front part of the brain is called the frontal lobe. The frontal lobe is important for things like focus and concentration, self-control and planning and executing multi-step activities. If someone has ADHD, attention-deficit/hyperactivity disorder, there seems to be something awry about the frontal lobes that make it difficult to focus and concentrate. Next is the parietal lobe. The parietal lobe is linked to sensation, the ability to feel things, as well as hearing and language. The temporal lobe is the area over by our ears on either side of the head and is involved in memory—thanks to the hippocampus—and also has a role in language. Finally, the very back part of the brain is called the occipital lobe. When you think of the occipital lobe, you should think of vision because this part of the brain is mainly involved in visual processing.